There are many ways you may choose to volunteer your time and talents with Adopt-A-Native-Elder. It is also an opportunity for you to meet people of all ages in a supportive environment. The mission and activities of the Program are highly dependent on the hundreds of volunteers who donate thousands of hours throughout the year. A variety of opportunities exist for volunteers and many skills are needed to accomplish the wide spectrum of work to complete the mission of the Program. Most of the needed volunteer hours are divided between activities at the warehouse, on Foodruns, during the summer at the Park City Farmer’s Market, Sheepdog Trials, and at the Annual Rug Show & Sale each November. Regular volunteer days are held at the warehouse every Tuesday and Friday from 9:00 am to 11:30 am as well as on occasional Saturdays. You are welcome to join us on either or both days. 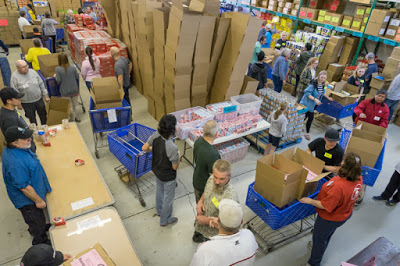 Activities include such things as packing food boxes, filling backpacks for school children, filling Christmas stockings, packing Grandma and Grandpa boxes, and many more things. The warehouse is centrally located: 328 W Gregson Ave., Salt Lake City, UT, just off I15 in the Salt Lake Valley. 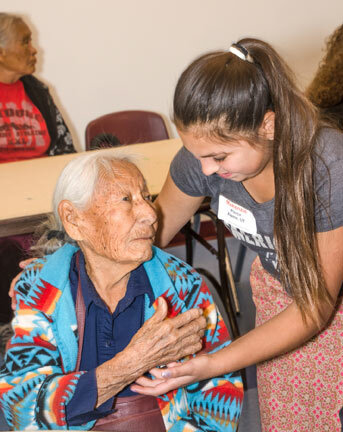 One of the principal purposes of the Program is to provide food, clothing and supplies to Elders on the Navajo Reservation through the Foodruns held every spring and fall. On our spring and fall Foodruns to 12 Reservation communities, volunteers help us to deliver the Rainbow Food boxes, simple medical supplies, wheelchairs, yarn and other special giveaways to the Elders. For the volunteers, the Foodruns provide a wonderful opportunity to interact with and serve the Elders. For those who have adopted an Elder, Foodruns are an opportunity to meet with their grandmas or grandpas. You will be enriched by your experiences on the Reservation and with the Navajo people as much as the Elders benefit from you. It is truly a cross-cultural meeting of hearts and hands. Click here to download a Driver’s Application for the next available Foodrun. For a glimpse of what a Foodrun is like, you click here to visit the Foodrun page. Over the years we have provided an important economic support for the Elders in our program and their families. In addition the show has been a major source of information for the general public about the Navajo culture and people. All of these objectives were met by this year's show with overall sales for the event reaching a new record. The Rug Show helps Adopt-A-Native-Elder create a market for the Elders’ crafts and raise awareness about the Elders’ needs. The Elders bring rugs, jewelry, and baskets to sell. They return home with all the proceeds from their sales. The Elders our program serves are the last generation of traditional indigenous people in the United States. We encourage as many people as possible to come and spend time with the Elders and their families at the Rug Show before their culture and traditions are lost to time. 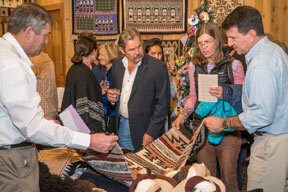 Please visit 2018 Rug Show photos to see a presentation of photos from the show. There are many photos here so the download may take a little time. Engage with A.N.E. through social media. Help us to spread the word to your own personal networks. Visit our Instagram and Facebook pages and like them and share them with your friends and family. This exponential exposure is a wonderful and easy way to increase awareness of a cultural treasure: Our Traditional Native Elders. Inspire people you know to help the Elders. Our support people have worked with their local clubs, churches and other organizations to help raise funds for our projects. For example, you might host a breakfast for friends to encourage them to learn more about the Elders and the Program.